<>Printing, customization, resizing services not included. SPORTS KITS CAN BE CUSTOMIZED TO ANY SPORT/ACTIVITY OR TEAM! Create your own custom layouts! Layered templates are editable in psd format (for Photoshop CS and above) - customize colors and text. 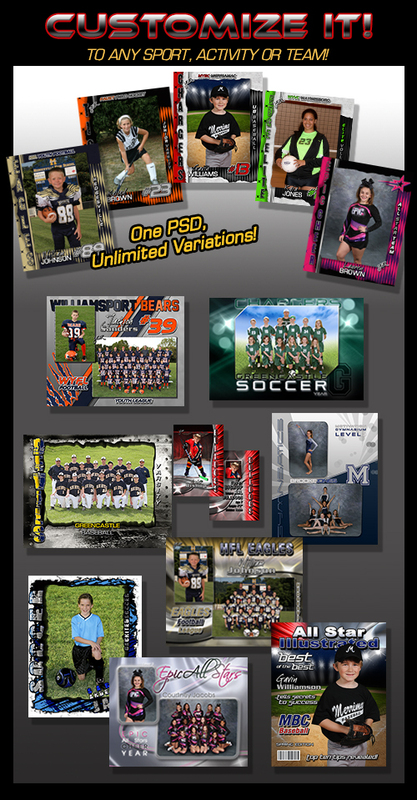 Add your images and sport or team specific graphics/mascot (optional). Mascot graphics seen here not included. Trader/Magnet, 3.5x5 - magnet size, easily resizes to trader! *Please note: 8x12 poster size crops/resizes to most standard print sizes, 5x7, 8x10, 11x14, 12x18, 16x20.